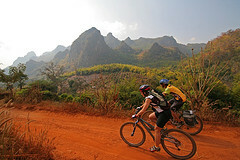 Make sure that you have the right pedals for your needs and level of biking comfort and know what are the differences. 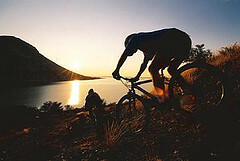 Read on for more information about mountain bike pedals, the different types, and which pedals may be best suited for your needs. For the average XC and trail rider, these are the pedals of choice. The only drawback is occasionally you cannot clip out and crash. They help to keep you more stable atop the bike and ensure that your shoes don’t slip off of the top of your pedals on especially rough terrain, where control is important. They help you with speed as well as they are much more efficient. I used cages first to get used to riding with my feet clipped in. Once I was comfortable, I switched to clipless. I was amazed how much easier it was to pedal up-hill. Now I feel funny pedaling on a regular bike with platform pedals. Practice on the grass before you hit the trails. I can attest to this. I practiced on the concrete. I stopped to let some cars pass and just fell right over. I used regular SPD pedals at first, but have now switched to egg beaters. Egg beaters shed mud very well for me when I am adventure racing. Egg beaters are the yellow pair pictured above. 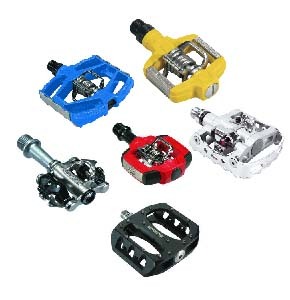 Cage pedals are another popular type of mountain bike pedals. These are pedals that are just like a square cage. They have a space for your foot to slide into, and that is how the foot stays stable in them. Next to clip less pedals, these are less popular pedals and more commonly used by mountain biking novices and beginners. They are not as efficient as clipless, but more so than platform. They don’t have the same stability offered by the clip less pedals. Some also use a strap that goes across the foot that is similar to cages. There is a different motion to getting out of these as opposed to clipless. You must slide your foot backwards, instead of sideways. It is a good idea to practice in the grass before you hit the trails. Platform pedals are the last type of pedals on the list. These are pedals that your foot sits atop, and although they do provide pretty good traction there is nothing physically holding your foot to the pedal. Long bike rides or high-speed mountain bike rides may not be the best thing if you have pedals like these as they provide less speed and control. You will see downhill riders, BMX riders and those who like to do tricks using these pedals for ease of balance and stability. Mountain bike pedals sounds like something simple, that few people other than mountain bike riders would have to worry about. That is not the case at all. There are so many different types of pedals out there. The pedals that you decide on are more important than you may think. Try out different pedal types and find out what works best for you. 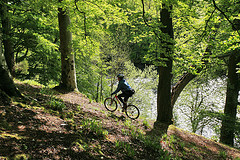 To read more about pedals and how to purchase a bike check out this book How To Buy A Mountain Bike. It has some good honest advice to get you on the best bike for you. It is a good idea to check out your l coal store for some good in person advice. It you decide to order online the two stores with the best prices are Jenson USA and MP Gear for Adventure Racing specific gear. If you need help with the maintenance of your pedals and bike try this book The Complete Guide to Bike Servicing."